Took a couple weeks to get dust collector. Not bad. Had some hesitation with housing being plastic. Then again car intake manifolds have been plastic for a long time. It is very light. Putting it together took some patience. There are many fasteners. It would have been good to segregate them to make finding them easier. Didn’t expect to be drilling holes or applying a peel and stick gaskets. Not a big deal. Could/should have been done by manufacturer. I was surprised to find a Leeson motor in place of the Baldor expected. Thought Baldor was advertised but don’t see now. Pretty sure that is what was in the FWW article. Assembled the unit and flipped it on. Heard a hum and then circuit dead. This happened twice. Called tech support and they were helpful. Took the motor off (9 bolts) and found impeller stuck. Turned it by hand and it freed up. While the motor was out, took the opportunity to tighten carriage bolts that hold legs on. This could be better designed. Carriage bolts are not the right fastener. Should have a square hole if they are used. Also, they should be longer so you can use vise grips to hold bolt while turn nut. The friction is not enough to keep bolt from turning. Putting the motor on takes patience as the housing is not metal. The threaded holes can move. Got it all together. Again.. Got some hose and adapters. Have to admit. The machine works really well. I always had trouble with the bandsaw (Laguna 16HD) dust. Very capable machine for resawing but makes a ton of dust. This machine captured it. Overall, at the moment I am very happy. Knocking one star off for the issues encountered and not having the Baldor. Probably would give 4 1/2. Looks like an interesting unit. I believe Oneida used to make the mini Gorilla cyclone out of steel. Plastic gives them more flexibility with geometry, rounding corners, etc.. and may be a better pic for that reason alone. But the prices I’ve seen online for this unit seem really high for a 1.5 HP set up. Mind sharing what you paid for it? Price was a bit steep. They had a $100 Father’s day sale. I used that and with shipping it was just north of $1k. I choked for awhile on it. Anyway, it is the only HEPA in the range, made in USA and works really well. You can see my concern with not finding the premium Baldor. Cool… I didn’t notice the MERV 16 filter. Don’t see them offered higher than MERV 15 very often. That’s definitely a big cost driver, but if you think you need it, you need it. I never had allergy problems until I got into a serious logging, milling, Timber Framing project when I was in my mid 30s, but I believe I was sensitized by exposure to a lot of things and I’ve struggled with them ever since. So I can definitely appreciate why someone would want to pay up front for HEPA performance (instead of pay the doctors later on). My son has asthma and my wife (and I) hate the dust. If we couldn’t address the dust issue, it would be the end of the hobby. I do hand tool working in the basement. Just use a broom/pan there. 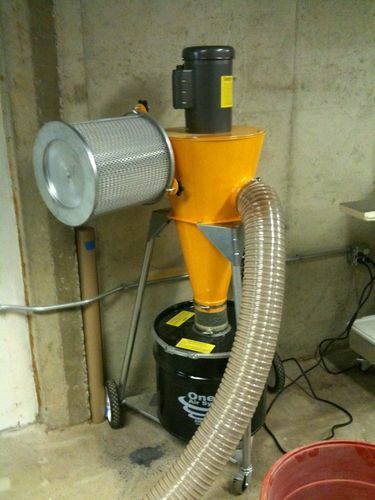 Congrats on the new dust collector! I really like the new design. I wish they had a trade-in or trade-up program—but then I would have to figure out how to ship mine back—never mind. I bought a mini-gorilla several years ago (still works great). The main body (cyclone) is metal. I’ll bet the new one is alot lighter. 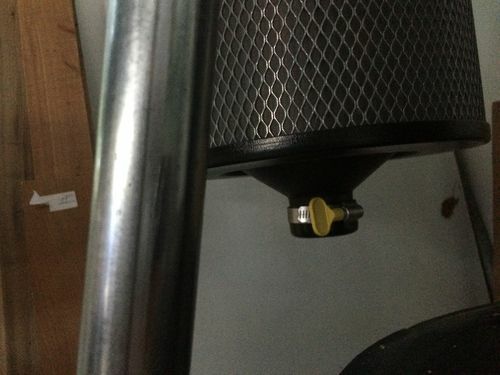 The old design uses “J” bolts to connect the filter and is not the most elegant method of attachment. It looks like the re-design has a port on the bottom of the air filter where you can hook up a shop vac? If so, that’s a nice feature. I assume that will enable you to use compressed air to blow dust out of the pleats and remove with the shop vac? Can you post a more detailed pic of that area? Why does Oneida make such nice dust collectors, and then outfit them with legs from a 1974 charcoal BBQ? Does this help? There is a band clamp there. It’s been about a year since your initial post. Do you have an update on the mini-gorilla? I’ve been looking at this unit for a while and it’s currently $75 off. What flex hose and accessories do you use?